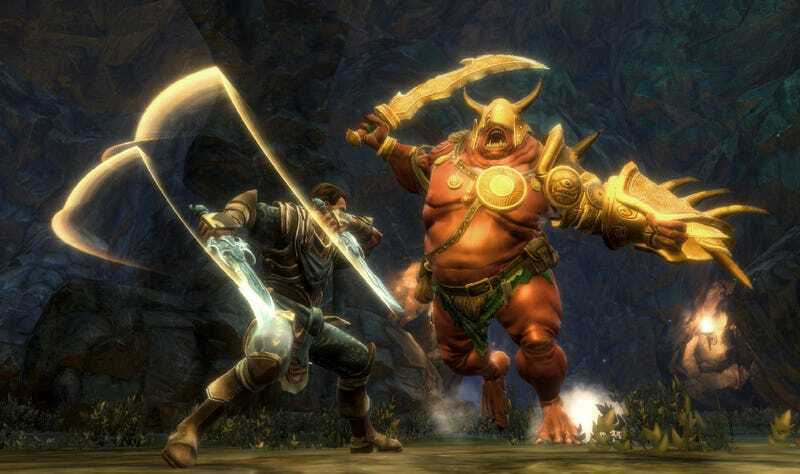 Everything about Kingdoms of Amalur: Reckoning seems designed to lose my interest. There's the title, the high fantasy setting, the silly race names. The entire game seems like a pastiche of all of the action role-playing titles that came before it. That's how I felt as I set through a demo of the game last week at Electronic Arts LA studio. Sean Dunn, studio manager at Big Huge Games, walked us through the backstory of the game, rolling out place settings and race names like Amalur, Almain, Varani, Ljosalfar, Dokkalfar. There were even a few I recognized like gnomes. As he spoke, the television filled with gameplay and video showing off a detailed, colorful world, but one not easily separated from its action role-playing game predecessors. He showed us some neat twist additions in his game, like the ability to sneak up on anyone and try to pickpocket, that getting caught can mean in-game jail time which can result in a fine or lost experience points. That you can create weapons from other crappier weapons and then tweak five basic components of your creations resulting in something special and unique. While combat isn't anything entirely new it was instantly satisfying. It sort of felt like an amalgam of what I love about God of War and Diablo. There's that clicky-button mashing need to obliterate your enemies backed with gratifying, graphic and clever take downs and abilities.